Mike T. is not a man to take things lying down. Diagnosed with pleural mesothelioma in Oct. 2011, he takes the disease in stride and refuses to let the cancer take control of his life. A firm believer in the power of positive thinking and affirmations, the four-year survivor regularly tells “the dirty mongrel” in his body to “get out and walk.” While the rebuke has not rid Mike of the cancer, it keeps him positive and focused on living a normal life. We first learned about Mike’s journey with mesothelioma in 2013. Two and a half years later, he is still going strong. He recently underwent a successful chemotherapy treatment to shrink a tumor covering 90 percent of his right lung and a smaller tumor under his right arm. Mike admits mesothelioma has not caused him to feel unwell or need medication. After coming through chemotherapy treatment with nothing more than a couple of mouth ulcers, Mike says he looks and feels like anyone else and never thinks of himself as a cancer patient. Mike works full-time as a check-in attendant at Australia’s budget airline Jetstar and loves it. He is grateful for feeling so well and believes his positive state of mind has a lot to do with it. The love of his wife, family and dedicated support of mesothelioma specialist Dr. Steve Vincent strengthens his positivity. Vincent diagnosed Mike with the disease, and he’s been there for him since he broke the news. Shortly after Mike completed his chemotherapy treatment, he received some wonderful news. Researchers conducting an immunotherapy clinical trial accepted the participation application Vincent had submitted for Mike. He was among 30 Australian mesothelioma patients chosen to take part. The trial, already successful in the treatment of melanoma, involves giving patients a vaccine containing dendritic cells harvested from their own blood. This type of vaccine is known as an autologous tumor cell vaccine. It’s complex and expensive. Dr. Edgar Engleman, medical director of the Stanford Blood Center, discusses how dendritic cells are used in cancer vaccines. Clinical hematologist Dr. Andrew Nichol is conducting the trial in Brisbane over a 20-week period. Participants receive the vaccine every two weeks. Prior to the trial’s commencement, a biopsy of Mike’s tumor and samples of his dendritic cells were sent to a lab in Japan. Technicians there stimulated the dendritic cells with Mike’s own antigens to identify and kill the mesothelioma cancer cells in his body. The vaccine containing those programmed cells was sent to Brisbane for the clinical trial. Every trial participant underwent the same procedure. Researchers are testing the effectiveness of the vaccine with chemotherapy in different stages: 10 trial participants received the vaccine prior to chemotherapy, 10 receive it during chemotherapy sessions and 10 take it post-chemotherapy. Mike is in the last group. Mike flew from Queensland to Brisbane for his first vaccine injection on Jan. 13 — the same day of his 62nd birthday. He believes the coincidence is a good omen. Researchers injected the vaccine into the top layer of the skin, known as the epidermis, of his right leg. So far, Mike has not experienced any side effects. He is excited and optimistic about the outcome. 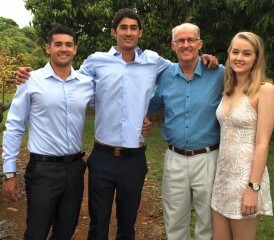 Mike intends to carry on with life as usual, working at Jetstar and spending every spare moment with his wife and family on their property in Cairns in Queensland. He is thankful for his good health and not taking it for granted. Mike protects his body as much as possible and recently made the decision to cease practicing taekwondo. He fears the Korean martial arts movements may lead to an accidental kick in the chest, possibly aggravating his cancer. Because Mike is a keen gardener, he gets all the exercise he needs mowing the lawns and trimming his numerous gardens. The backyard pool also provides him with gentle exercise and a chance to cool down at the end of the day. He knows proper nutrition plays an important role during and after cancer treatment, and he watches what he eats, but he admits he’s not as strict with his diet as before. Mike will drink an occasional glass of wine — which he jokingly describes as “good medicine.” He also allows himself the guilty pleasure of Kentucky Fried Chicken and McDonald’s. His favorite greasy food: Potato scallops (A popular dish in Australia made of battered and deep-fried potato slices). Lorraine Kember is the author of "Lean on Me," an inspirational personal account of her husband's courageous battle with mesothelioma. She is an accomplished public speaker in Australia and is passionate about sharing her journey with cancer. Her website can be found at www.lorrainekember.com.au.